Last Thursday marked an important escalation in the US-China trade spat as the first import taxes were collected by the US Customs and Border Protection agency on agricultural machinery and aircraft parts from China. With the return of Wimbledon to our screens, I find myself with the sudden urge to play every weekend. This doesn’t last long, however, as my enthusiasm on the court quickly dissipates once I remember my hand-eye coordination needs vast improvement if I am to stop hitting tennis balls over the enclosing fence. Safe to say, it appears my tennis career is over before it has even begun and I won’t be giving up the day job anytime soon. Equity market returns were as inconsistent as my forehand last week, specifically lacking consistent direction across the regions. 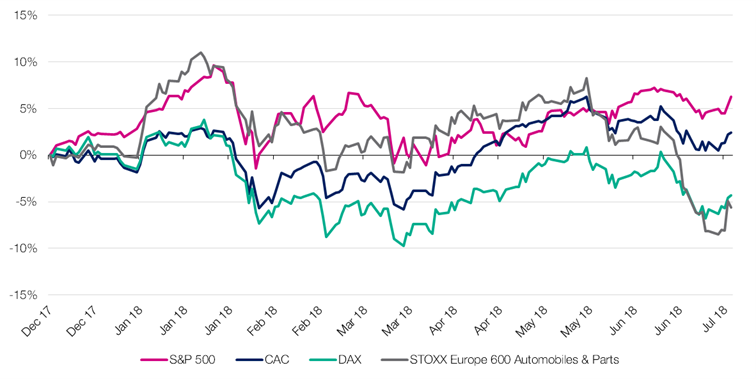 Asset class returns in sterling and local currency are below; riskier assets have remained broadly stable despite the imposition of the first tariffs on Chinese goods entering the US market. After months of tough talk, last Thursday marked an important escalation in the US-China trade spat as the first import taxes were collected by the US Customs and Border Protection agency on agricultural machinery and aircraft parts from China. Until now, commentators have broadly dismissed the probability of a trade war actually materialising. Consequently, the intensifying risks to integrated global supply chains, especially throughout the Asia-Pacific region, are now beginning to rattle markets. While Asian equity markets took a hit last week, the US market has avoided falling into negative territory year-to-date, protected by its FANG heavyweights whose share prices have continued to rise, seemingly insensitive to trade wars. That said, the US technology sector is not totally immune to trade wars, highlighted by fall in share price for Micron Technology, a US semiconductor manufacturer, following a Chinese patent ruling in favour of a Taiwanese peer. Remarkably, the unfolding of this trade war was broadcast by Chinese social media in real-time as a cargo ship laden with US soybeans raced to beat retaliatory tariffs. Unfortunately, arriving at the Chinese port of Dalian just half an hour after the Chinese Ministry of Commerce ordered the new customs arrangements, the ship represents one of the first casualties of these new bilateral tariffs. To avoid paying the significant new tax on imported produce, it is expected that future Chinese imports, especially of soybeans, will be sourced from other large exporters which is a significant blow to the US industry. As alluded to in my piece last week, officials at the US Federal Reserve have noted that an increase in trade barriers threatens to slow corporate investment which in turn will likely have a dampening effect on economic growth. While corporates with international supply chains are most at risk of escalations, arguably those hit hardest will be consumers who will face higher prices for their end products. Despite this, unemployment data for June, released a short while after the retaliatory tariffs came into effect, showed no signs of pressure, a bellwether for business sentiment. The timing of this tussle is key for the US President; with mid-term elections coming up in November this year, the first ever US tariffs against Chinese imports will play to Mr Trump’s core supporters who have helped push the “America First” doctrine into the White House. Though the US President turned his sights to the lucrative European car industry leading to a sell-off in targeted European stocks, automakers pared their losses following the willingness of the US Ambassador to Germany to meet executives from the German auto-industry to discuss a zero-duty regime. A subsequent offer by the European Union to enter a multi-lateral trade agreement to eliminate remaining automobile trade barriers gave a further boost to the European industry. While the actions of the US Ambassador and the EU’s willingness to open up its industry are welcome, the reality of Mr Trump’s actions on global trade may dampen any positive outcome. STAT OF THE WEEK: 1990 – the last year England got to the FIFA World Cup semi-finals (BBC). Data correct as at 06/07/2018.